In this week's episode of The IMPACT Show, Bob and Nick had a lot to talk about. 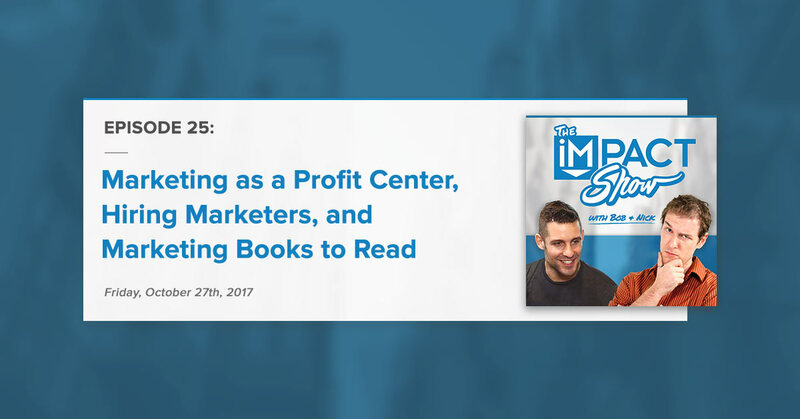 They covered whether or not Google AMP is the right choice, how to turn your marketing into a profit center, how you can hire a marketer, as well as the 10 marketing books you should read. Like what you saw? Make sure to subscribe for email reminders and give us a review on iTunes. Dan Moyle’s putting together a list of podcasts that would be great for professional speakers. They can be instructional, inspirational or strategic. If you know of a podcast that would help a professional speaker in their career, please share in IMPACT Elite. There's like 6 or 7 of us engaging in an awesome conversation, you're welcome to jump in. Where each week, Nick and I share one thing from the world of digital marketing that caught our eye and we found interesting to share. Google AMP, is it the Right Choice for You? At IMPACT, we haven’t made the move to AMP yet… doesn’t mean we won’t. The fact of the matter is this… AMP is still relatively new, but it will improve. Google wants you to stay on their platform. Ask yourself what you want to accomplish and why you’re doing it. Understand what you’re good at and what you still need to master. Fully immerse yourself in what you’re doing. Connect with people, whether that’s through LInkedIn, following them on Twitter or suggesting coffee dates. And look for ways to go above and beyond. At one point, Murnaghan even set a client’s daughter up with friends in Canada, where the girl was about to attend university. Even on my call with Murnaghan, she offered to take me around Ireland and make a list of off-the-beaten-path activities on my next visit. The best salespeople I have seen are not only thoughtful but proactive with being helpful. Murnaghan definitely possesses this trait. Article: "How an Extry-Level Employee With Zero Digital Marketing Experience Became HubSpot's Top Salesperson"
Before we dig in.. start thinking about how the things we’re talking apply to your company. If you have any challenges or questions that you want us to address, leave a comment or send us an email to show@impactbnd.com. We’ll get to as many as we can either at the end of the show or during next week’s episode. What does turning your marketing into a profit center mean? Bob was inspired by Joe Pulizzi especially after reading his books, "Content Inc" and "Killing Marketing". Creates new opportunities for the business. Bob’s vision/Fantasy: Where at the crossroads of whether we become a really big agency or morphing into a publishing company. Bob wants IMPACT to help everyboby, especially the underdogs in business that Bob relates to so much. We hire for culture and skills, can't be one or the other, but both. Are they bought into your purpose? At IMPACT, our purpose is to help people and their organizations succeed. Have you shown them the vision? Those are our core values, and we believe that all inbound marketing agencies should have them. Feel free to copy them. So why don’t we go over the Top 10 Marketing Books we’d recommend, Nick? Everything from how to turn your company into a content organization, from start to finish, all the way up to how to turn your marketing into a profit center. Digital companion - guides, assessments, trainings, printable templates etc. I think The Ultimate Sales Machine by Chet Holmes is the ideal primer to the game we're all trying to play here. It's got everything. Wildcard choice - recommended to me by Amazon based on past purchases. We'll be back again next Thursday, Nov 2nd at 1:00 PM ET.We're taking a poll in IMPACT Elite on what next week's topic should be. So, be sure to vote. Until next time... get out there and make it happen.